(16/17) TRENTON – With temperatures in many parts of the state expected to approach freezing over the weekend into early next week, the Department of Environmental Protection and Department of Agriculture are working cooperatively to allow farmers to do controlled open burning or use specialized torches known as smudge pots to protect flowering crops from frost damage. Forecasts call for near or below freezing conditions overnight Saturday through April 5. The cold temperatures could affect fruit and vegetable crops, as well as flowers in bloom or near bloom. Peaches, blueberries and apples are particularly susceptible. Frost damage now can significantly reduce yields of these crops later in the season. The DEP and Department of Agriculture are allowing these steps through April 5 to protect farmers’ livelihoods and to ensure that consumers will be able to enjoy an ample supply of Jersey produce later this year. 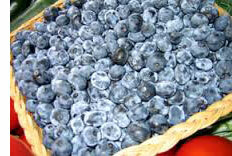 New Jersey is among the nation’s leaders in blueberry and peach production. Blueberry production is focused in the Pinelands of Burlington County. Peach orchards can be found throughout the state, with Gloucester County ranking among the nation’s leaders in peach production. New Jersey also sustains a vibrant apple industry, with orchards found around the state. Farmers who believe they will need to conduct open burns and/or use smudge pots must provide notice to the DEP’s 24-hour Communications Center at 877- WARNDEP (1-877-927-6337.) Notification to DEP does not require the implementation of either technique but ensures proper procedures are followed should they become necessary. If a farmer does not call DEP in advance but uses either technique, the farmer may notify DEP the morning following the use of either technique but no later than 9 a.m. Farmers must record the incident number provided to them by the Communications Center. Materials expected to be burned. A statement verifying that all restrictions in the open burning or use of smudge pots were followed. No open burning will be permitted unless the temperature within the orchard area is at or below the critical temperature for the bud stage for that particular crop and wind velocity is less than five miles per hour. Smudge pots must be fueled only with either kerosene or No. 2 fuel oil. Open burning can consist only of either the following materials: clean and untreated scrap lumber, felled trees, clippings pruned from trees and shrubs, hedgerows or firewood. Absolutely no refuse, trade waste, tires or garbage of any type may be added to the authorized open burning material.